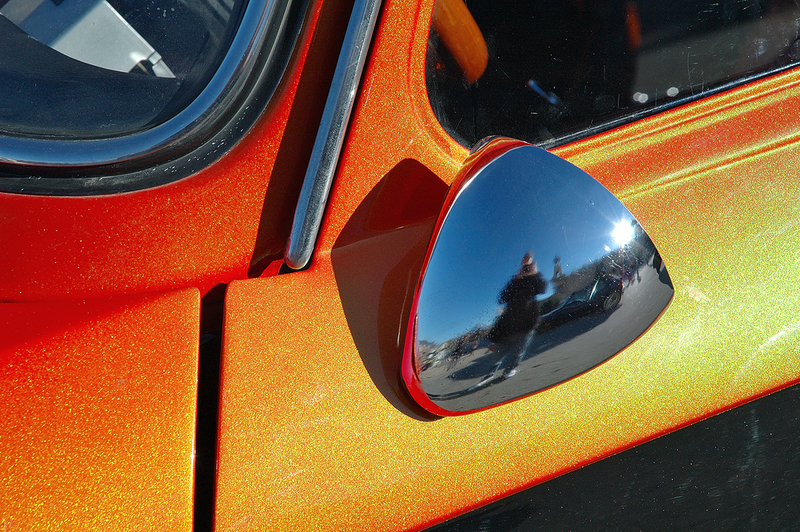 My reflections on the side mirror of a classic car. Notice the iridescent orange coat of paint with polished finish that gives the auto an authentic 70s kind of mood. I don't like pictures with the photographer trapped inadvertedly in the image but they acquire a different dimension if we are part of the story somehow, accidentally or on purpose. Interesante reflejo!! Con el sol, el fondo y tu mismo bastante distorsionado! Y un color increíble... hey, me gusta tu avatar, es graciosisimo! Fantastic colours. A beautiful self portrait. I do like it. I took a photo of an set of 18-wheeler truck wheels. They had tiny chrome hubcaps and somebody pointed out that our car was in the picture. I looked and sure enough there it was. Nice photograph and the paint job looks nice too.